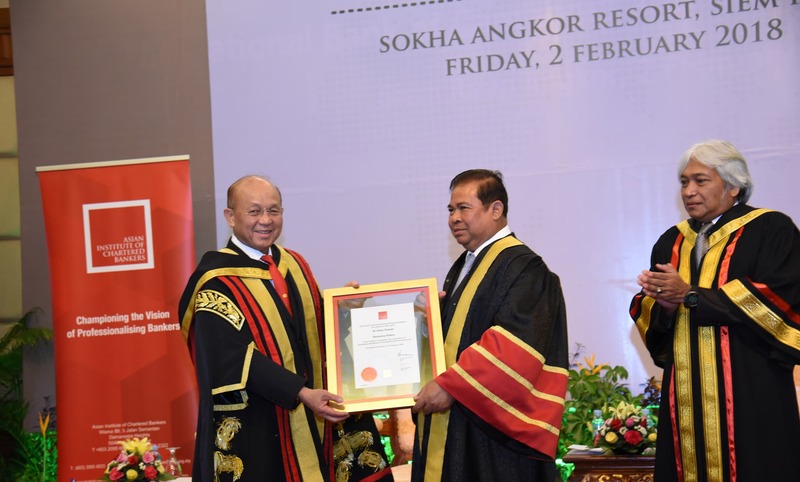 AICB chairman Tan Sri Azman Hashim (left) conferring the AICB Honorary Fellowship Award upon His Excellency Chea Chanto, Governor of the National Bank of Cambodia. Witnessing the conferment is Governor of Bank Negara Malaysia Tan Sri Muhammad Ibrahim. Congratulations! (from left to right) AICB chairman Tan Sri Azman Hashim, National Bank of Cambodia Governor His Excellency Chea Chanto, Bank Negara Malaysia Governor Tan Sri Muhammad Ibrahim and AICB chief executive Prasad Padmanaban. 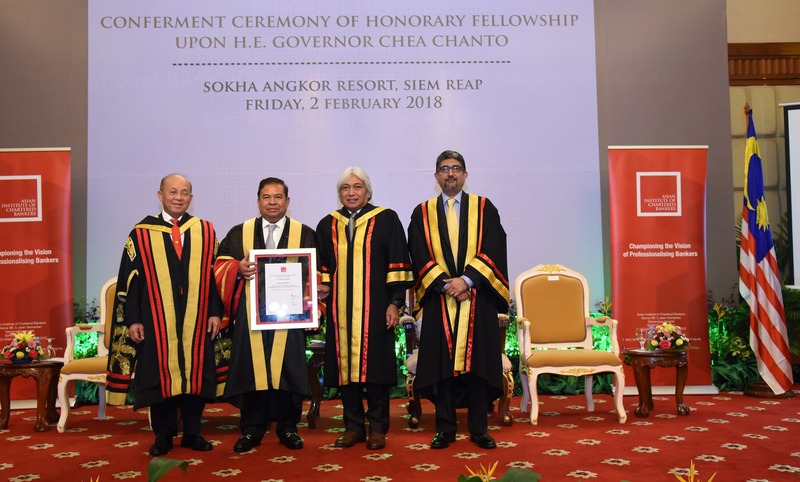 SIEM REAP (Feb 2): The Asian Institute of Chartered Bankers (AICB) has conferred an Honorary Fellowship award, its highest accolade, on the governor of Cambodia's central bank in recognition of his leadership and contribution to transforming the nation's banking industry. His Excellency Chea Chanto of the National Bank of Cambodia (NBC) — the longest serving central bank governor in Asean — is the first ever recipient of the award. He became governor in 1998. The Fellowship was conferred on him here at a ceremony this morning by AICB chairman Tan Sri Azman Hashim and witnessed by Bank Negara Malaysia (BNM) Governor Tan Sri Muhammad Ibrahim. He said the governor was instrumental in rebuilding Cambodia's banking sector into a strong financial system underpinned by market-based development, including a transparent regulatory, supervisory and prudential framework. "Under His Excellency's stewardship of the NBC, numerous banking reforms which strengthened Cambodia's banking system were introduced. Cambodia's banking system has now been modernised and integrated in the regional and international financial system," he added. The award also further strengthens bilateral ties between Malaysia and Cambodia. In his acceptance speech, the Cambodian governor noted that the country's banking sector had grown significantly since the central bank was re-established in 1979. "Today, banking is one of the country's best performing economic sectors. We remained focus on strengthening the banking system, building a rich talent pool and striking the right balance between financial inclusion and financial stability to boost economic activity," said Chea. According to the NBC's latest annual report, the Cambodian banking sector saw a 31.8% increase in foreign capital inflow in 2017, a result of new foreign banks and stricter capital requirements imposed by the central bank. This compares to a mere 0.8% increase in the non-banking sector. Cambodia's banking sector comprises more foreign banks than local ones. Several Malaysian banking groups including Public Bank Bhd, Malayan Banking Bhd, CIMB Group Holdings Bhd, Hong Leong Bank Bhd and RHB Bank Bhd have operations there. Last year, two new banks — France's BRED Bank and Japan's Mizuho Bank — were set up. The award by AICB, the professional body for the banking services industry in Malaysia, comes as it increasingly looks to venture beyond Malaysia. According to CEO Prasad Padmanaban, the institute currently has over 12,000 members from Malaysia, Cambodia, the Maldives, Myanmar and the Philippines. "We have also signed collaborative agreements with Jaminan Kredit Indonesia, the Ateneo Bankers Association of the Philippines Institute of Banking, the Maldives Monetary Authority and work closely with several banks in Cambodia and Myanmar to further develop professional education. This growth reflects the growing reputation of the AICB's qualifications among bankers both domestically and regionally who are looking to build a reputable career in the banking industry," said Prasad. The AICB is governed by a council that comprises representatives from BNM, The Association of Banks in Malaysia, and the Malaysia Investment Banking Association.